Industrial Inkjet Printer with Winder Rewinder Machine, we are dealing with designing and building inkjet printer with winder rewinder. Also, it is designed for more accurate printing. Such relevance and requirement are increasing with the rising standards of the Flexible Packaging and Converting Industry. 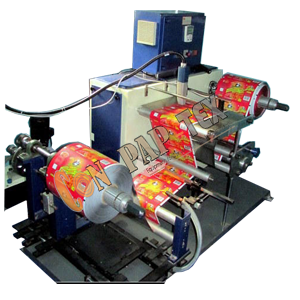 It makes us most experienced manufacturer, exporter & supplier of Industrial Inkjet Printer with Winder Rewinder for Batch Printing Machine. Cantilever design-balancing body for easy loading and unloading of parent / rewound reel. Movable unwind stage for Edge guiding System (Hydraulic Web Aligner). Mechanical 1.5 / 2.5 Kg. Optional Magnetic powder brake with tension controller & Torque control potentiometer. Provision for incorporating Inkjet Printing System with Hot air ink drying. Copyright © 2018 www.re-reelingmachine.com | All Rights Reserved. Imitation, Copying or Using Photographs or Text from this Website is a Punishable Offence. CONPAPTEX reserves the right to change specifications & design without prior notice to incorporate latest development.